Organize your tools and equipment, add a garage, or use one of these custom-built structures as a pool house or home office. 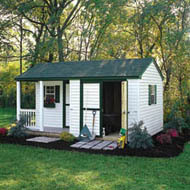 Our sheds feature first-quality materials and superior design. 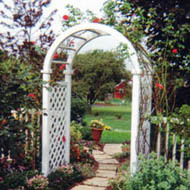 Arbors add charm to the landscape. You can use them alone, as support for climbing flowers, or to mark a gate or walkway in your fence line. They’re also available in both wood and PCV, to match the surrounding fence. Contact us to get price quotes on sheds and arbors.